jello – What's Cookin' @ Special Collections?! Happy Independence Day from What’s Cookin’ @Special Collections! Roanoke Times Article of Interest! A feature post is on the way this week, but in the meantime, here’s a local news story on one our favorite, jiggly topics: Jell-O! Check out this Roanoke Times article by Lindsey Nair. Jell-O is like the princess in the fairy tale: it is as good as it is beautiful. (It’s so remarkably easy to digest that the children can have second portions, too.) But even the princess’s fabled accomplishments are no match for Jell-O’s versatility! Jell-O Company. 1928. Today– what salad– what dessert? : Jell-O brings dozens of answers–. [S.l. ]: P. Co. In a recent episode of Sunday Morning on CBS, there was a short (6 minute) story about Jell-O, including its history, gelatin art, and new approaches to cooking with it (think Modernist Cuisine). 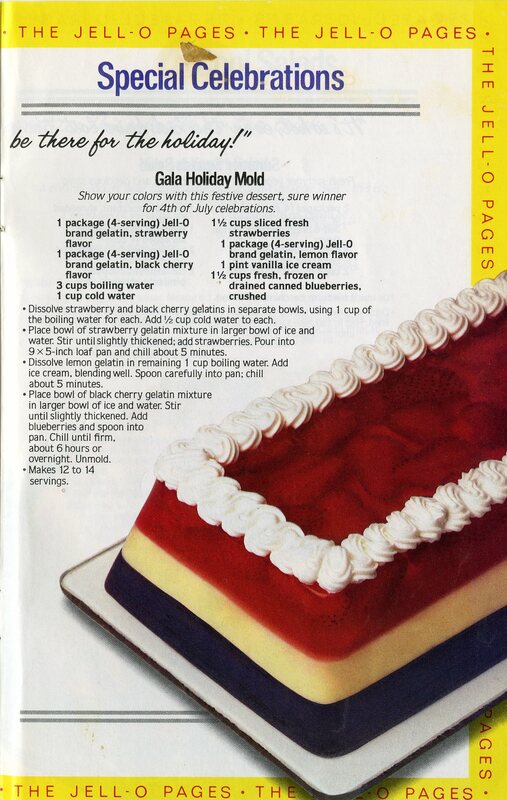 For several years during the 1960s and 1970s, Jell-O produced Whip ‘n Chill. It came in a mere four flavors-chocolate, vanilla, strawberry, and lemon-but there was no lack of recipes! Electric colors aside (go on, take another good look at the first photo above), the powder was mixed with milk to create something with a texture akin mousse. Many of the recipes in this particular pamphlet are familiar to the Jell-O fan: fruit in and on top, molded towers, multicolored loaves. But there are also new marvels here, too: Peppermint Candy Igloo (center above), petit fours, pies, parfaits, and even ice cream. Whip n’ Chill was born in a time of chemical innovation and the ingredients list reflects that. But it was also part of wave of simplifying, convenience, spending a little less time in the kitchen, and a little more time elsewhere. So, frightening as the ingredients may to be some modern readers, it was actually successful on all counts—at least for a few years. For those of you who miss the familiar and sometimes described as “chemical” taste, or those wanting to try it, you can still acquire Whip ‘n Chill from the occasional Internet retailer…if you want to buy 8lbs of powdered mix at a time. (And yes, people ARE still looking.) Even though I feel I may have missed out on the experience, I think I’ll pass this time. A child’s wading pool of “Four Flavor Loaf” might be just a bit too much. To the rest of you, though, I say, happy whipping, happy chilling, and happy gelatin-izing! 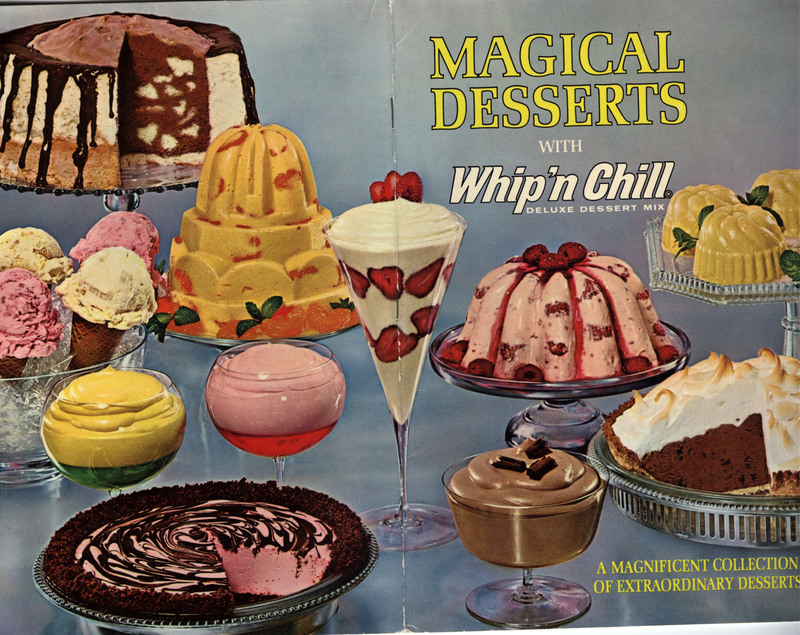 “Magical Desserts with Whip’n Chill,” 1965. Culinary Pamphlet Collection, Ms2011-002, Special Collections, Virginia Polytechnic Institute and State University, Blacksburg, Va. Some of the publications in the Culinary History Collection are small give away items or mail-order pamphlets. Among them is “Mr. Gourmand’s Strange Dream,” produced by Jell-O around 1925. It includes a vignette about one wife’s nightmare-inspiring desserts. The cure? Lighter and tastier gelatin desserts. And of course, sample recipes are included! “Mr. Gourmand’s Strange Dream,” c.1925. Culinary Pamphlet Collection, Ms2011-002, Special Collections, Virginia Polytechnic Institute and State University, Blacksburg, Va.